Neil Kinnock has said that when he steps down as a European commissioner he's planning to become "a bloody old nuisance". Speaking to BBC News Online earlier this year, he said he had the likes of Robert Mugabe in his sights once his Brussels role comes to an end. But whatever he does, Mr Kinnock - and the possibility of it becoming Lord Kinnock one day is far from remote - will always have a place in Labour history for the crucial role he played in transforming the party. Some within Labour still hate him for that. Others give him great credit, and say Tony Blair owes his predecessor an enormous debt of gratitude for beginning the party's long road to recovery. 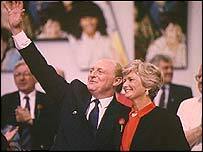 It is now 20 years since Mr Kinnock became Labour leader, taking over from Michael Foot after the party's battering at the hands of Margaret Thatcher in the 1983 general election. Now he watches the UK political scene from Brussels and for all Labour's current difficulties, he looks on with satisfaction at seeing the party he loves in power. Mr Kinnock was born in Tredegar, South Wales on 28 March 1942. He went to Lewis school, Pengam before going to University College, Cardiff to study industrial relations and history. With a postgraduate diploma in education also under his belt, he worked as a tutor and organiser in industrial policy and trade union studies for the Workers' Educational Association between 1966 and 1970. Mr Kinnock's long career at the heart of mainstream UK politics began in 1970 when he was elected as an MP. He served the Bedwellty seat until 1983 when it became Islwyn, and he remained an MP until 1995. He first joined the shadow cabinet in 1980, speaking on education, with many starting to tip him as a future party leader. Indeed, during the disastrous 1983 election campaign he was seen as one of Labour's few success stories. And with Michael Foot's subsequent resignation, Mr Kinnock became party leader. Soon after becoming leader, he began what became one of the defining battles of his leadership - the long and bitter tussle with the hard left. In a famous conference speech in Bournemouth in 1985 and amid chaos in Militant-controlled Liverpool, he took on the hard left, prompting uproar in the conference hall. The battle with Militant became one of the high points of his leadership, prompting a series of expulsions as Mr Kinnock tried to take Labour back to the centre left. Unilateral nuclear disarmament, pulling out of the European Union and large-scale nationalisation were among the policies whose reversal he oversaw. The battle came hand in hand with the rise of Peter Mandelson and efforts to portray Labour as a party of the mainstream. As Militants were thrown out, in came the red rose. Essentially, however, Mr Kinnock's leadership ended in failure. Expected to oust the Tories in 1992, John Major was unexpectedly returned to power. Labour blamed vicious attacks on their leader in the press; others said a famously triumphalist rally in Sheffield a few days before polling day played a big part too. Mr Kinnock himself still seethes at the way he was treated by the press. The "Welsh windbag" label stuck. Soon after the election, looking pale and tired, Mr Kinnock resigned as Labour leader, with John Smith elected in his place. He remained an MP until 1995, when he became European commissioner for transport. He became vice-president in 1999 with the testing responsibility for internal reform. He has been dogged by a recent row over his handling of a whistleblower controversy. Former Commission chief accountant Marta Andreasan was suspended after she complained that the EU budget was open to fraud and abuse. 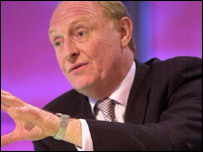 Mr Kinnock steps down from the commission in 2004. He hasn't ruled out sitting in the House of Lords - but has said he would rather do so if the opportunity to be an elected member arose. "I could say 'no' to that but I know, given me, that I may as well say 'oh yeah, I'm not going to breathe,'" he said earlier this year. He plans to watch more sport and theatre and see more of his grandchildren - he and wife Glenys have two children. And inspired by his wife's role as an MEP trying to tackle the "tragedies and catastrophes" in the developing world, he has said a role in that field is a possibility. "You've got to get stuck in," he told BBC News Online this year. "So maybe something like that, because I've been such a good boy for 25 years, I've been so bloody respectable and responsible...I'm going to be a bloody old nuisance. "There is always a case for attacking evil and if you are in the position that I'll be in a couple of years time, [I'll] actually have the time to do it. A lot of full-time politicians haven't got the time to do it."